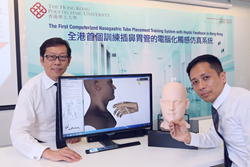 The School of Nursing of The Hong Kong Polytechnic University (PolyU) has recently developed a computerized haptic system for nasogastric tube (NGT) placement training, enabling nursing students to practise NGT insertion in computer-simulated virtual environment. The system, supported by General Research Fund (GRF) under Research Grants Council of The Government of the Hong Kong Special Administrative Region, is the first computerized haptic system developed for training nurses in clinical skills in Hong Kong. Nasogastric intubation, through the nostril and the throat, is an essential clinical procedure for inserting a plastic tube into the stomach for feeding or drainage. However, the placement is a blind process in which the tube may be misplaced and could lead to unexpected complications or fatal incidents. Hence, the training of placement techniques is very important to every nursing student. Conventional training in NGT placement includes lecturing the theories in classroom, followed by small-group clinical teaching with instructors demonstrating the practical skills. The hands-on learning of skills is usually conducted on low-fidelity mannequins. The mannequins cannot respond to the user, render human anatomy realistically and provide the actual sense of insertion forces. To address these limitations, a computerized virtual training system is developed by the School of Nursing of PolyU with the application of force models to simulate NGT insertion and render the feedback forces through a haptic device. Two methods were used to calculate the force needed. The first method is “Engineering Mechanics”, which involves the numerical calculation of the forces between the NGT and the nasogastric passage as if they were structures in engineering design. The other is “Expert System”, leveraging the knowledge and experience of expert nursing professionals to compute the forces. With these methods, the system can simulate the insertion forces at different locations along the nasogastric passage, as well as the static and dynamic friction between the NGT and the nasogastric passage during the insertion process. This computerized simulation can provide students with safe, standardized, repeatable and self-paced training with interactive feedback like gag and coughing reflexes of the simulator during NGT insertion for more realistic experiential learning and performance evaluation of the students. In addition, a graphical user interface is specifically built in the system to visually and virtually display the tube’s position inside the body, so as to facilitate the cognitive and psycho-motor training for the blind process. Quantitative measurements, in terms of completion time and insertion force applied during the virtual NGT placement, provide students with feedback of how well they perform the NGT placement. These functions and learning occasions are not possible with conventional training using mannequins. Nursing professionals and academics positively commented that the computer-generated forces of the system are similar to what they experience during the real NGT placement of patients. The system will enhance the skills of NGT placement of the students and advance clinical nursing education. To evaluate training effectiveness, the School of Nursing at PolyU is planning to conduct a pilot run in the 2016/17 academic year for students to use this system as a supplementary training platform to the conventional training approach. The research team will also enhance the features of the system by adding other simulated insertion outcomes such as the coiling of NGT inside the mouth during insertion, and rigorous body responses and movements of the virtual patient; and to develop another high-fidelity simulator for the training of urinary catheter insertion.